The 99th Tour de France completed it’s 3,496.9 km journey through Belgium, Switzerland and France, today. 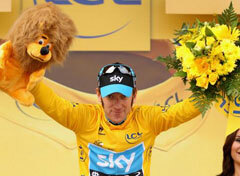 History was made with British rider Bradley Wiggins of Team Sky taking the final maillot jaune (yellow jersey) being the first of his country to do so, his teammate Chris Froome joined him 2nd on the podium, also a first. Another teammate of Wiggins, Mark Cavendish, also made history with his fourth straight victory on the Champs-Élysées.